Central Civil Services Cultural & Sports Board has been organising the Music, Dance and Shor Play competition for central Government Employees for the last many years. There were demands from a large number of participants and employees that a similar programme may also be started for their wards to motivate and encourage them. 4. Decision of the judges will be final and no appeal against their decision would be entertained. 5. 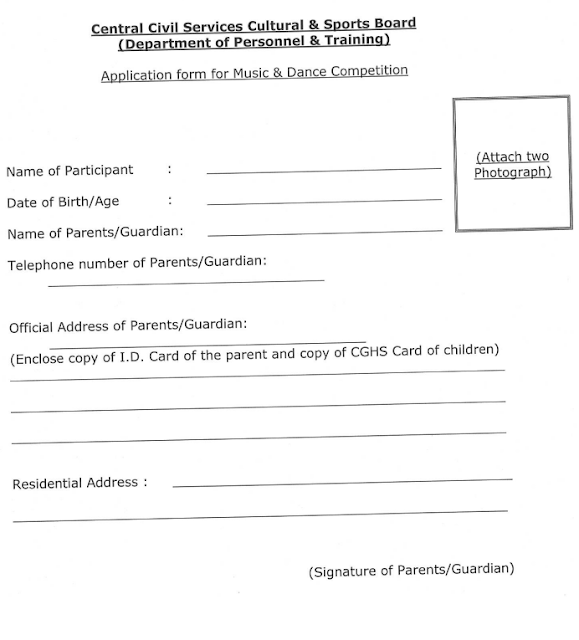 For further queries , Neelu Sun (9910983139) Convener, CCSCSB (Music, Dance and Short Play) may be contacted. 6. The circular may be given wide publicity. Note: each participant should with his/her guardian during competition.